1. Boil 2L of water. 2. 600g of broccoli is about 2 large heads of broccoli. I usually just trim the broccoli of any discolouration and leaves, and then add the whole broccoli with its stalk to the boiling water. Boil for them for about 5 minutes, then remove the broccoli and save the liquid for later. 4. In a frying pan, melt the butter and fry the onion, garlic and celery until soft. To this mix, reduce heat slightly and add the flour and stir thoroughly for about 1 or 2 minutes. Add some liquid from the soup pot until you get a thickened mixture. 5. Put this thickened mixture into the food processor or blender, and blend it with the broccoli. If needed, you can add more liquid from the soup pot. How creamy you want your soup depends on how long you blend. 6. Pour the blended mix back into the soup pot, add in the chicken cubes and oats, and then turn up the heat. The oats thicken the soup and gives it a nice flavour and texture. 7. When the soup is boiling, stir in the milk, all the broccoli, nutmeg and pepper. Heat the mixture until it simmers or until tiny bubbles appear at the side. It’s ready to serve. However, if you’re using the thermal pot like me, I usually put it back into the thermal pot for a time to let the flavours mix. You do not have to reheat the soup before serving. 9. Freeze whatever soup not consumed. 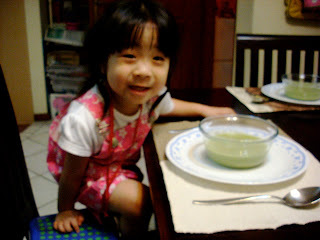 You can also substitute the broccoli with watercress for cream of watercress soup or potato and carrot for potato soup. =) Also, you can add salt or pepper to taste, but our family finds that the soup is tasty enough without additional salt. I like my cream soup soupy-thick, rather than gravy-thick. Have you tried cream of mushcroom soup by any chance? I tried and couldn't make it smooth enough.